Dinosaur Comics - August 16th, 2010 - awesome fun times! August 16th, 2010: FUN FACT: I wrote the first version of this comic on May 7th, 2010, and was about to put it online when I checked one of my favourite comics, Nedroid and saw he'd run one with the EXACT SAME PREMISE, just hours before me. So I emailed Anthony to congratulate him and he emailed me back admitting that as a nightmare creature he feasts on dreams and found mine delicious; that's exactly how I remember things going down. 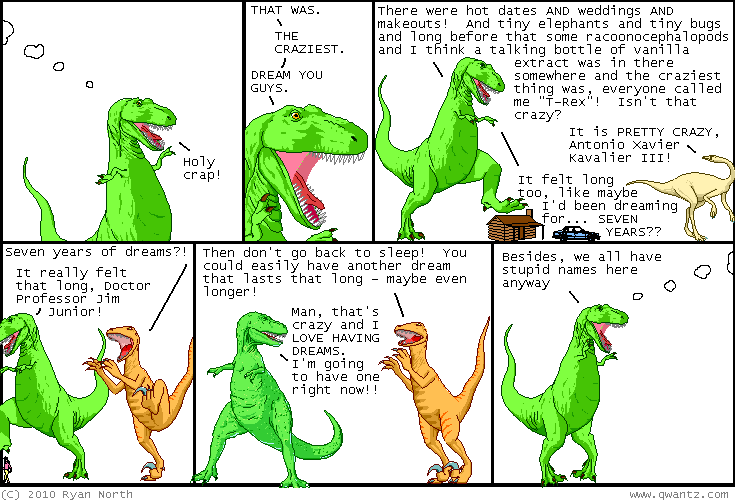 Anyway what with Anthony's doing my proposal comic I thought I'd use the premise anyway, because now every Nedroid comic, past present AND future, each and all take place in the dreams of a single (non-canon, alternate universe) installment of Dinosaur Comics! OOPS, SORRY ANTHONY!